Harmonise and deploy road safety technology – such as driver assistance systems, (smart) speed limiters, seat-belt reminders, eCall, cooperative systems and vehicle-infrastructure interfaces – as well as improved road worthiness tests including for alternative propulsion systems. Develop a comprehensive strategy of action on road injuries and emergency services, including common definitions and standard classifications of injuries and fatalities, in view of adopting an injuries reduction target. Focus on training and education of all users; promote the use of safety equipment (seat-belts, protective clothes, anti-tampering). Pay particular attention to vulnerable users such as pedestrians, cyclists and motorcyclists, including through safer infrastructure and vehicle technologies. Some of these have already, or are about to be, implemented such as anti-tampering which was not the end of motorcycling that some riders thought was approaching. Safer guardrails seems to have stalled both on the European stage (as in Northern Ireland where the continued fitting of wire-rope barrier systems with no identification of advantageous spots for motorcycle friendly barriers to be fitted). Our own adaptation of the specific mention of a “Focus on training” includes the 3rd European Driving Licence for riders which was implemented in the UK in January 2013 but agreed in the European Parliament back in 2006. Effectively, what we have is a licence regime that riders do not like, even some EU governments have reservations e.g. the focus on training should be not retrospective but look towards what we should have. After an analysis of the contributions to the consultation a summary report will be published by the European Commission and these contributions will feed into the stock taking of the 2011 White Paper on Transport. 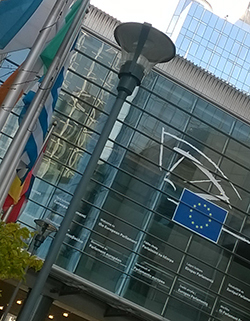 The European Commission consultation finishes on the 2nd June 2015. Recently the TRAN (Transport & Tourism) Committee of MEPs in the European Parliament debated the presentation of a working document on the white paper from Dutch MEP – Wim van de Camp called the “Implementation of the 2011 White Paper on transport: taking stock and the way forward towards sustainable mobility”. Apparently according to the TRAN Committees latest newsletter, the presentation was followed by a lively debate with general agreement that the report should focus on the specific actions needed to achieve the objectives of the White Paper. 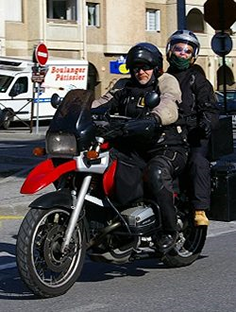 What this new focus could mean for motorcyclists, (considering the mention of “zero-vision”, dreaded by some motorcyclists in its original form) and what is included in “improved safety measures” in the world of the European Commission and the European Parliament, needs clarification, understanding and an input by riders! The presentation of the draft report is due back in TRAN on 13th – 14th April 2015, with a deadline for amendments on the 20th April 2015 and a vote in the TRAN Committee on the 28th May 2015 followed by a vote in plenary (EU Parliament) in July 2015. This will form the parliament’s position concerning the EU Commission’s own mid term review of the white paper. I did qualify my statement by saying Perhaps. I have been riding bikes now for more than 50 years and i was in the police service for more than 20 of my adult years. I have seen many changes in motorcycling in that time and been involved with many others whom i have riding with or not as the case may be. No police stats will record any ill health or possible health problems or causation such as tiredness, Simply ticking a box that says excessive speed etc. Even hospitals cannot or do not bother to record health issues and bring it to the attention of the police or coroner. Unless they obviously believe that some condition impaired the ability of the dead. My statements re hormones such as testosterone and adrenalin have been taken from the pages of the medical journal Lancet, from some years ago. They had nothing to do specifically with motorcycling but all to do with the effects of both hormones upon the body and the subsequent results after highs. Particularly with regard to the after effects of adrenalin and how it can impair a persons cognizance and behaviour, eyesight, moods etc. when a person cannot function properly and may suffer by making increased errors. Similar things happen with hypothermia due to cold when cognative behaviour is altered. Hypoglycemia undiagnosed also has an effect as does high blood pressure or increased anxiety or .other medical issues that a driver hidesand does not report to the DVLA for fear of losing their licence. There are many possible causes other than those simplified for police purposes on stats forms. Many we will never ever know about. What is apparent to me from the stats re age of riders and power of modern bikes is that some do not or have where with all to ride with a greater degree of safety ……due to whatever reason. I failed to say Bad Attitude and disregard towards road safety, there own and that of others. .I stand by what i said. Apart from the stereotypical “returning biker” – “mid-life crises” supposition where is the evidence? By evidence we mean from collision stats – police reports from collisions – urban and rural – fatal/serious/slight injuries – coroners reports – hospital treatment reports. If there is evidence, is it UK wide or specific to certain areas, what about the rest of Europe? Or is this in the UK all fed by an assumption of no evidence, there is a difference between what is perceived and what is actually happening on these dry sunny days and weekends. Either can I suspect – maybe you can – say whether riding attitude – behaving like testosterone filled and adrenalin fueled hooligans – was a factor in a rider returning to their families without being in a coffin. What a rider having “Some will have families and maybe small kids.” has to do with riding we don’t know other than used as some sort of guilt trip to “educate” riders. The only part we picked up of any use would be ” little or no knowledge of how to handle that much power” which would suggest and where we would agree regarding training either when learning to ride (not just past a test) or post rider training, which is really bout knowledge and upping that knowledge! The problem here in Northern Ireland is that this supposition of the “bad rider” has been propagated by evangelistic road safety “experts” who have spent millions of pounds of government money on “advertisements” campaigns (not education) on shock/death/awe trying to change the apparent problem attitudes of all road users. On top of that they produced a horrendous document which has been withdrawn and hopefully will never see the light of day on attitude. So perhaps your thoughts on attitude in its part of blaming riders for their own demise is not placed in the right place to not have it challenged. For our part of Europe – Northern Ireland – we can offer “evidence” through our study on motorcycle fatalities – “Northern Ireland Motorcycle Fatality Report 2012″ an indepth study of 39 cases relating to motorcycle fatalities in Northern Ireland (UK) between 2004 and 2010.” another study to today’s date would be useful to do. A brief summary or fatalities in Northern Ireland in 2014. Thirteen motorcyclists have lost their lives in fatal collisions, in total in 2013 there were 10 motorcyclist fatalities. Two motorcyclists were killed in collisions with tractors – Eight killed in collisions with cars – three with no other vehicle involved. Looks to me like those men aged 25 to 50 need to know more and receive more training and attention than any of the other ages. I suppose they are on full licences and therefore ride powerful high capacity bikes. Perhaps back to biking bikers. with little or no knowledge of how to handle that much power and / or suffering a middle age crisis and behaving like testosterone filled and adrenalin fuelled hooligans. Riding out on sunny dry days at weekends or evenings. Going out for a bash or a blast. Some will have families and maybe small kids. Should greater efforts be made to intercede and effect a change in riding attitude so that they can return to their families without being in a coffin. 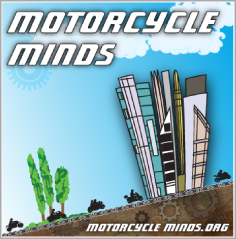 The draft report from Wim van de Camp has been updated and now includes an extra paragraph with specific mention regarding Powered Two Wheelers (PTW’s – motorcycles – scooters – mopeds).